Summer on the mind? Join local chef, Anna Maria de Freitas as she makes a batch of Lavender Peach Punch at the Farm using the Organic Culinary Lavender that we grow and harvest from our own fields on San Juan Island. Doesn't this sound delightful on a hot, summer afternoon? We are looking forward to seeing Chef Anna Maria this year at the San Juan Island Lavender Festival, where she will be demonstrating many more tasty lavender recipes. 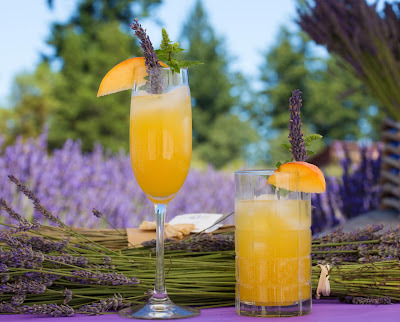 To make your own Lavender Peach Punch at home you'll need Organic Culinary Lavender. Grown exclusively in our organically certified fields, our Organic Culinary Lavender comes from the first of the flowers to be harvested each summer. For more about cooking with lavender.